Some of the completed houses in the SummerGlade project. There may be more high-end contemporary landed units in Cyberjaya going forward as more developers move into this segment of the property market. Cyberjaya, conceptualised 15 years ago to complement the new administrative centre of Putrajaya, started off as a township with predominantly condominium and apartment units. Touted to be the most wired city in Malaysia, the 2,800ha project was planned to be the information technology (IT) city of the country. Its aim then, and still is today, was to attract world-class multimedia and IT firms to set up businesses there. With more than 600 companies and a growing population which currently number about 50,000, developers are now focusing on building high-end landed residential units. It is reported that up to 27% of Cyberjaya has been developed, while over 40% of the landbank is under development and in the planning stage. 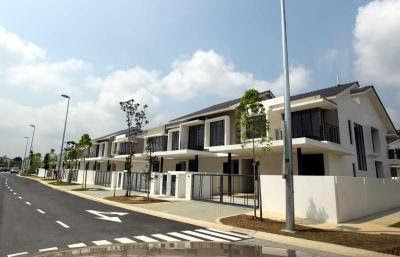 Suntrack Development Sdn Bhd, a niche property developer, has completed a high-end residential project, SummerGlades, on its 23-acre site, with a total of 137 units of super-liked terraced housing. This project has a density ratio of 6 units to an acre, which is viewed positively. As a rule of thumb, there are generally 22 units of terraced housing, or eight semi-detached units, or four bungalows to an acre. Launched in 2010, this development has two noteworthy features. It fronts the Putrajaya Lake with a neighbouring commercial centre, which provide SummerGlades with the leisure and commercial factors. That is particularly important as Cyberjaya, as a city, is still very new and conveniences like these are important. Its second positive factor is the overall layout of the development. Houses are not designed in barrack-style rows. Instead, the residential units curve around its inner roads and about 40% of its land area are landscaped. Although the project is fenced, it is not a strata-development. Last year, the project received a five-star award for Best Residential Development in Malaysia from the Asia Pacific Property Awards 2011 in association with Bloomberg Television. The other landed project that is currently being developed in Cyberjaya is Symphony Hills, a project by UEM Land Holdings Bhd. This will be a landed strata development with cluster housing comprising terraced, semi-detached, super-linked and possibly bungalows in future. There are also plans to have two condominium blocks comprising 800 units. There will be 411 landed housing and condominium units on 98 acres, which effectively means a higher density ratio when compared with SummerGlades. Depending on the design and type, on a per sq ft basis, the first phase of Symphony Hills was launched at about RM370 per sq ft. The smallest built-up is more than 3,200 sq ft. Prices on a per sq ft basis may exceed RM500 in some cases for the larger units. About a third of this 98 acres will be landscaped, as with most high-end developments today. Next to Symphony Hills, Paramount Property Development Sdn Bhd, which is part of the Paramount Corporation company, has also launched its landed strata development. The Paramount developed Paramount Garden in Petaling Jaya decades ago, to be followed by Damansara Jaya and subsequently Kemuning Utama. While these are generally bread-and-butter terraced housing with no frills, the company has gone into the branding and high-end mode. Sejati Residences will be the company's foray into the high-end sector. “We want to move up the value chain,” says Paramount Property Development Sdn Bhd managing director Datuk Ricque Liew. “It is no longer enough to give buyers a beautifully designed and fitted home. Sejati Residences (will offer) spacious luxurious living admist an expansive natural stting with designs that invite the outdoors in,” he says. The 50-acre freehold development will have a mix of 249 landed houses, comprising bungalows, semi-detached units and super-link terraces spread across 40 acres. In terms of density ratio, this means Sejati Residences will have 6.2 houses to an acre. The remaining 10 acres will have a high-rise condominium project. Phase one, comprising 78 units, was soft-launched about two weeks ago. About half have been sold with three-storey superlinks with built-ups of between 3,805 and 3,838 sq ft being priced at RM1.4mil. Liew says the project will be planted with 1,200 trees and there will be a 8km jogging path. There will be a clubhouse build from timber salvaged from a shoe factory in Klang.